In the middle of hunting season, its hard to take days that could spent in the woods and head to the water. I've missed the bulk of fall's fabulous fishing for too many years. I swore this year would be different, but so far I was wrong. I had two November days penciled in on the calendar for fishing, and those were at the request of a friend to float some out-of-state family members of theirs down the Missouri for a weekend. I really enjoy taking folks, especially now that I have a highly functional river boat, but that still wasn't going to be my time for pursuing the lunkers of fall. Although we did catch a few good ones those two days. work with cross-stream casts, swinging the plug in streamer fashion, but with much more action and covering much more of the river. The difference was immediate. These fish were on the chase, and hookups picked up. 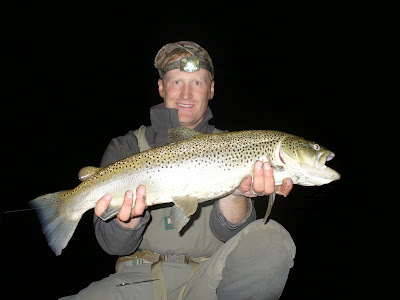 By dark I'd landed four or five browns in the 20 inch range, among other solid ones, and several pesky little rainbows. I'd covered several hundred yards of river, and I'd driven to a new section once. As darkness fell, I went back to my original hole. I dressed a little more warmly and strapped on a headlamp. I still had faith that this is where the some big ones were likely staged, and they'd probably be much more likely to cruise at night. I landed two more good ones in the dark. The second of the two and final fish of the evening was my best brown of 2014. There was no moon. It was black as it gets. Casting relied entirely on knowing what was in front of me beforehand. Working a lure is tough to do blindly. Even the tiniest sliver of moon would have made a world of difference for targeting seams and structure. Without having fished this hole in the daylight, I could have done nothing with it. As it was, the majority of my casts were likely ineffective and passing over water I wouldn't have casted to if I could have seen. But I'd done what I'd set out to do - I had squeezed in some fishing time into a day that wouldn't normally have found me on the water. I'd tied into a number of quality fall browns, and one of them was very near a personal best. Maybe it was. And all of them are back out there to be caught again - hopefully on a moonlit night or on some foam hoppers next summer.